mellicious | Where've you been? What a great photo! It's so evocative of a time and a place. My first thought is that it's very American Gothic-esque. 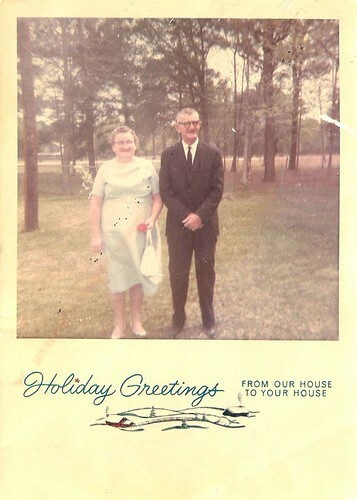 It's such a wonderful mix of images, with the formality of the clothes against the natural backdrop of the trees, the stiffness of your aunt's and uncle's poses with the warmth conveyed by the holiday greeting. It makes me imagine they would be very warm, inviting hosts, if one were lucky enough to be their guest.